Louisiana, 1869 – the two bounty hunters arrived in Ganger Narrows, hot on the heels of the McGill Gang, pursuing their prey to the shadowed dome of Black Salt Island, where even the locals fear to tread. For evil walks upon the island. There are old things there. Dead things. And some things are best left buried. Also includes the first instalment of a new ongoing backup strip, Homestead. “My love for all things West continues and grows. This may be filler, or it may be part of the bigger story – we’ll find out in time I’m sure. But even if it does prove to be filler, it’s grand, exciting, ridiculously over the top filler, a perfect little Saturday night at the movies sort of comic.” – Richard Bruton, Forbidden Planet. 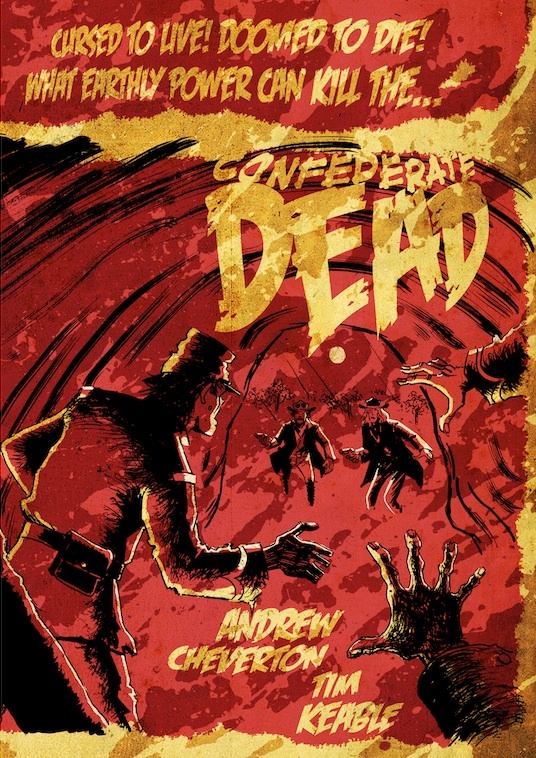 Confederate Dead is the fourth issue in Volume II of West – 20 pages of black and white story, with full colour covers, written by Andrew Cheverton and illustrated by Tim Keable.